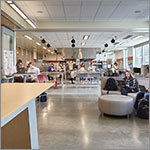 The new Academic Building at Wilson High School is designed for flexible learning, and to encourage collaboration between teachers and students. 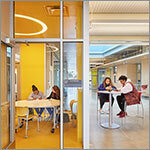 Operable glass partitions separate the classrooms acoustically from the shared learning area in the center, or they can be opened to allow flow between the spaces. Brightly-colored conference rooms facilitate small-group interactions and a learning stair provides ample seating for large group presentations and activities. 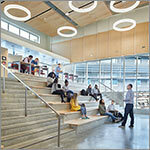 Markerboard panel walls and soft seating support spontaneous discussions throughout the space. Several specialized programs are housed on the first floor: the Autism program, Media Lab, the TV Studio and Culinary Arts. 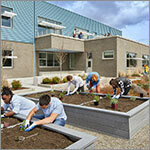 Multiple raised planter beds are available to students to grow food for the culinary program and a sensory garden provides a decomposed granite pathway, a bridge, and textured and fragrant plants for autistic students. 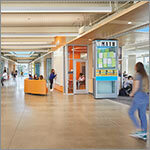 Construction at Wilson High School has been accomplished on a fully occupied site over multiple phases. 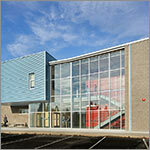 Phase 2 removed and replaced three buildings with a new Academic Building and a new Music Building. The Gymnasium and Pool facilities were renovated. 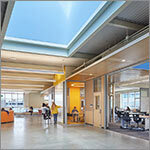 Sustainable principles were incorporated, including daylighting and displacement ventilation, increasing energy efficiency and improved interior environmental quality.